I know I have said it before, but Mbuyu Beach Bungalows really and truly does fit the bill of a loving home away from home. 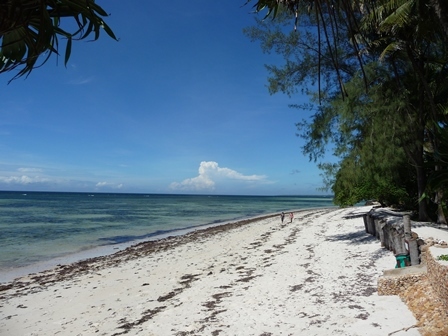 The location, right by the friendly coastal village of Msambweni, South Coast Kenya, sure helps to settle right in and feel like in ‘beach vacation heaven’ ! Isabelle Graedel & Werner Zeppenfeld, a Swiss/German couple and the owners, couldn’t be more welcome and one feel at home right away! 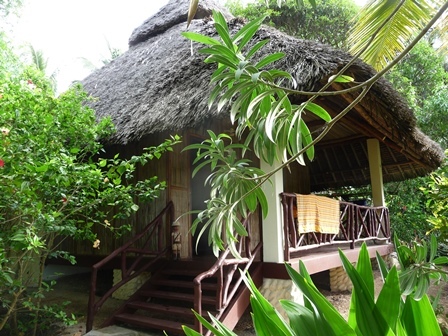 It is a small lodge, right on the beach, off the beaten track. There is a small village right by the property and it is perfectly safe to wander around, even in the late afternoon/evening. If time allows, the hosts are easily persuaded to come along for a walk. 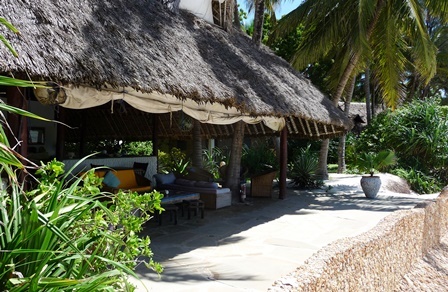 Mbuyu Beach Bungalows are about 45 km south of Mombasa and fairly easy to get to. You can go by plane to Mombasa or straight to Ukunda (Diani Beach Airstrip), where you can asked to be picked up from or take a taxi. If you are coming by car from Nairobi to Mombasa, cross the Likoni Ferry and then head southward along the coast. 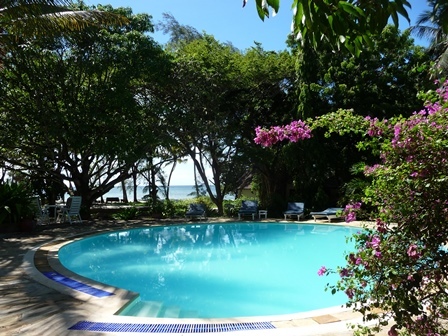 The well-equipped Makuti bungalows all have ceiling fans and a small fridges, private bathrooms and terraces overlooking the sea. There are also mosquito nets in every bungalow and I found them to have the best ever functionally I’ve ever seen!! You will find hammocks strung between palm trees, a brilliant big swing to lay and rest on under the most beautiful baobab tree on the property. The whole property is very green, with lush grass and beautiful flowers & palm trees. When it comes time to eat at the cute little restaurant overlooking the beach and onto the ocean, you can opt to sit alone or join everybody for breakfast, lunch & dinner. Everything is very relaxed and the food is absolutely delicious! The staff is a delight, especially the cook and his right hand! There is a small local fisher men harbor close by and if you can manage, wake up early enough (sun-rise) to see them go out onto the ocean……the perfect photo opportunity. And there is something about seeing them set sail and head out; so calming and peaceful. Walking on the beach is like balm for the soul and the white soft sand lures you into the warm clear water for a swim. As chance had it we had a bit of rain, but even that didn’t damper our spirit and we went for a swim with a bit of rain ‘on top’. Which I’ve never done, but it was actually pretty darn amazing. The sun came out shortly afterwards and we warmed up nicely again on the beach. The afternoon called for a dip in the pool as the tide pushed out the water too much to be able to swim and it was brilliant. There will be a spa up shortly to enjoy close to the pool and this, if I need actually need it, will be another reason to come back soon for an ‘inspection’! 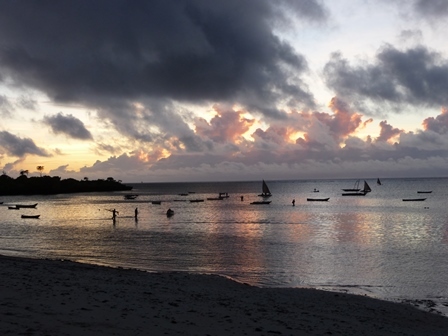 It was very hard to say good-by to Mbuyu Beach Bungalows, but the memory is still very strong and I know, that I will always be welcome back…..which I will be soon! If you are interested in staying at this lovely place, please do send your details etc with below form, and we will reserve a booking for you!